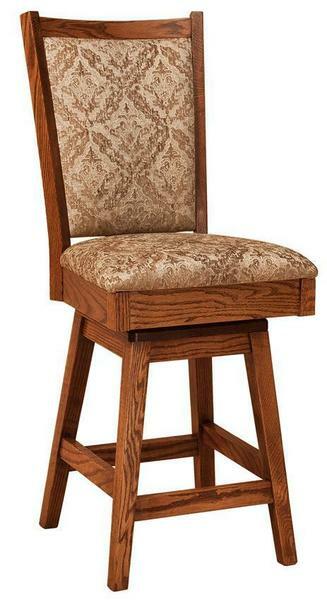 Will you choose fabric or leather for your Amish Kalispel Upholstered Swivel Bar Stools? Quality materials make them last, Amish construction makes them durable and beautiful, and your selected options make them a reflection of your personal style. The Kalispel beautifies your kitchen dining scene as it offers seating that's comfortable, functional and fun! With a padded back and seat and some swivel action to boot, this solid wood bar stool will bring family and friends alike up to the counter. Make use of your beautiful counter or bar space with bar stool seating you can enjoy. For morning coffee, a late night dessert or daily dining, custom made bar stools paired with your kitchen counter, bar or island make winning combinations. The Kalispel offers transitional style for your kitchen furniture collection, combining the luxury of traditional style with the clean, exciting shapes of the contemporary. Transitional furniture is not limited in its design and adapts well to changes in decor throughout the years. Browse more of our transitional style furniture for other areas of your home. Seat Height from Back: 19 1/2"